Skid resistance depends on a pavement surface’s microtexture and macrotexture (Corley-Lay, 1998). Microtexture refers to the small-scale texture of the pavement aggregate component (which controls contact between the tire rubber and the pavement surface) while macrotexture refers to the large-scale texture of the pavement as a whole due to the aggregate particle arrangement (which controls the escape of water from under the tire and hence the loss of skid resistance with increased speed) (AASHTO, 1976). Skid resistance changes over time. Typically it increases in the first two years following construction as the roadway is worn away by traffic and rough aggregate surfaces become exposed, then decreases over the remaining pavement life as aggregates become more polished. Skid resistance is also typically higher in the fall and winter and lower in the spring and summer. This seasonal variation is quite significant and can severely skew skid resistance data if not compensated for (Jayawickrama and Thomas, 1998). Skid resistance is generally quantified using some form of friction measurement such as a friction factor or skid number. It is not correct to say a pavement has a certain friction factor because friction involves two bodies, the tires and the pavement, which are extremely variable due to pavement wetness, vehicle speed, temperature, tire wear, tire type, etc. Typical friction tests specify standard tires and environmental conditions to overcome this. In general, the friction resistance of most dry pavements is relatively high; wet pavements are the problem. The number of accidents on wet pavements are twice as high as dry pavements (but other factors such as visibility are involved in addition to skid resistance). Table 1 shows some typical Skid Numbers (the higher the SN, the better). 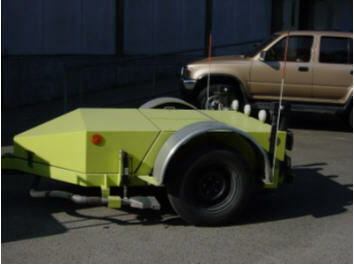 A test vehicle with one or more test wheels incorporated into it or as part of a towed trailer. A standard tire for use on the test wheel. The standardized skid-test tire, a tubeless, bias-ply G78x15 tire with seven circumferential grooves, is defined by AASHTO M 261 or ASTM E 501. A newer tire, one with no grooves, appears to be gaining acceptance as well. By defining the standard test tire, the tire type and design are eliminated as variables in the measurement of pavement skid resistance. To take a measurement, the vehicle (or trailer) is brought to the desired testing speed (typically 64 km/hr (40 mph)) and water is sprayed ahead of the test tire to create a wetted pavement surface. The test tire braking system is then actuated to lock the test tire. 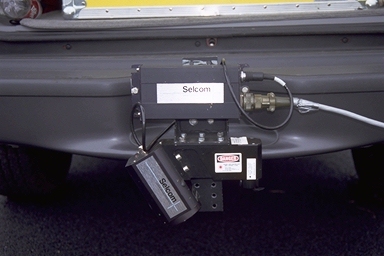 Instrumentation measures the friction force acting between the test tire and the pavement and reports the result as a Skid Number (SN). No force measurement is necessary, the force can be computed by knowing the test wheel’s moment of inertia and its rotational acceleration (Wambold et al., 1990). Force measuring devices for the locked wheel tester cost a significant amount of money. Because the test tire is in contact with the pavement while locked for a much shorter time than the locked wheel tester, it significantly reduces test tire wear. Because pavement skid resistance is tied to surface macrotexture, some methods seek to measure a pavement’s macrotexture then correlate it with skid resistance as measured by some other, more traditional method. The simplest surface texture measurement is the sand patch test (ASTM E 965). The test is carried out on a dry pavement surface by pouring a known quantity of sand onto the surface and spreading it in a circular pattern with a straightedge. As the sand is spread, it fills the low spots in the pavement surface. When the sand cannot be spread any further, the diameter of the resulting circle is measured. This diameter can then be correlated to an average texture depth, which can be correlated to skid resistance. A texture depth of about 1.5 mm (0.06 inches) is normally required for heavily trafficked areas. Laser or advanced image processing equipment are capable of determining surface macrotexture from a vehicle moving at normal travel speeds. 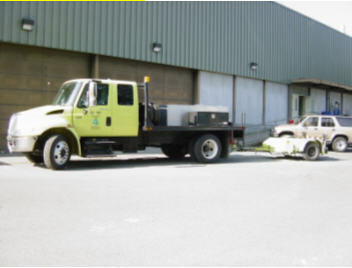 One particular device, the Road Surface Analyzer (ROSAN), a series of non-contact pavement surface texture measurement devices, has been developed by the FHWA’s Turner Fairbanks Research Center Pavement Surface Analysis Laboratory. The ROSAN (see Figure 3) can be used for measuring texture, aggregate segregation, grooves, tining, joints, and faulting (FHWA, 2001). ROSAN systems have been used in a number of NCHRP and FHWA sponsored studies. Some integrated analysis units can use surface texture measuring to estimate skid resistance. Figure 3. Prototype ROSAN device (circa 1998). The one drawback to this method is that a pavement’s surface macrotexture does not entirely determine its skid resistance. Therefore, correlation between surface macrotexture and skid resistance is often difficult to extrapolate into any general guidance.